This foundational administration course covers the major aspects of installing, configuring and managing a highly available Citrix Virtual Apps and Desktops 7.1x environment. Gain an understanding of the solution architecture and communications, and the factors that contribute to a successful deployment. This five-day course will teach you how to deploy and deliver apps and desktops; install and configure StoreFront and Citrix Workspace App, set up profile management, and configure policies, printing and basic security features. You'll also learn how to monitor and troubleshoot the environment with Citrix Director. This training will help you prepare for the Citrix Certified Associate in Virtualization (CCA-V) exam. 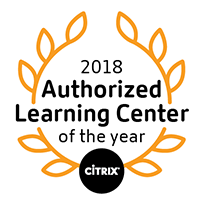 This course requires little to no previous experience with the 7.x version of the platform; however, Citrix recommends completing the free Citrix Virtual Apps and Desktops 7.1x Introduction bundle at elearning.citrix.com. This course helps prepares candidates to get the CCA-V certification.